I'm kicking it old-school and keeping it simple, folks, with this post, because I'm leaving for vacation soon and running around like a factory farm chicken with its head cut off. 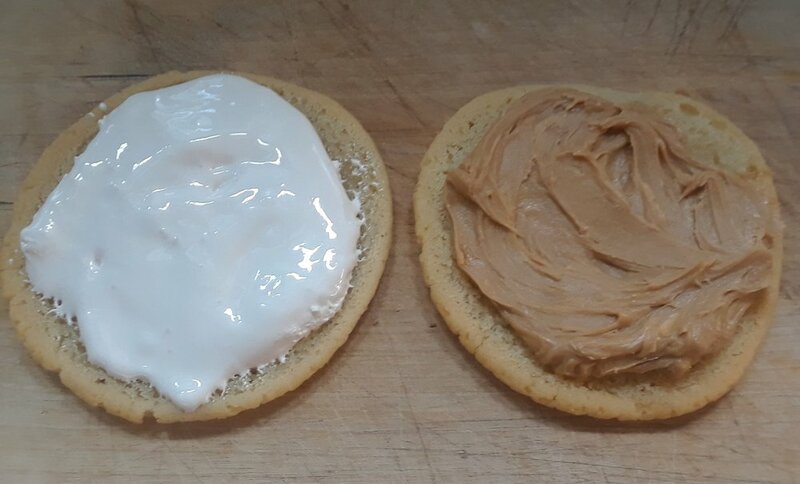 I need fuel and nothing fancy, so I channeled my love of the classic fluffernutter sandwich into cookie form. When I return, I will be taking it to eleven with regards to cookie complexity in order to compensate, so hold onto your butts. Even number of round sugar cookies. You can cheat with store-bought dough or use this terrific recipe. 1. Spread a thick layer of marshmallow fluff on underside of one sugar cookie. 2. Spread equally thick layer of peanut butter on underside of matching sugar cookie. 3. Marry the two undersides to form sandwich. 4. Enjoy with a very cold glass of milk.